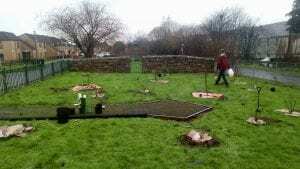 On Friday December 21st we were able to break ground and begin planting the Yoker Community Forest Garden. 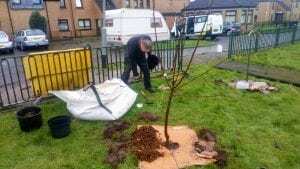 Working with several community groups and the Glasgow City Council, training volunteers and sharing the design process, the dream is finally a reality. 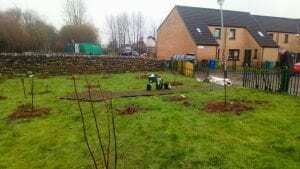 Yoker’s forest garden will have more than 40 different edible and medicinal species in a small 10m x 20m space. 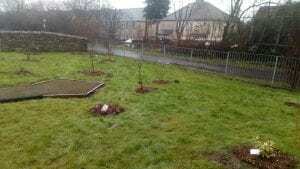 With the help of our volunteers we have already planted all of our trees. These include pear, two varieties of apple, cherry, juneberry, and two types of hazelnut. There are also trees that enrich the soil with nitrogen while producing food: thorny olive and siberian pea tree. 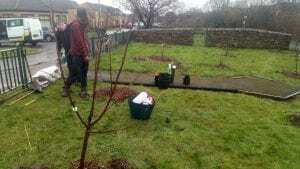 We also planted most of our shrubs which will include 3 types of currants, gooseberries, and jostaberry. We have lots more to plant; several types of berry and a whole bunch of herbs, flowers, and vines. 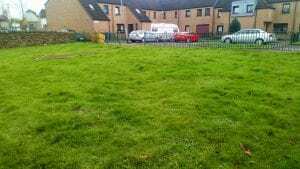 Unlike a normal annual food garden, the amount of food produced will slowly increase year after year, and with very little work. Besides harvesting the fast growers and replacing some mulch, the forest is designed to take care of itself! Edible forest gardens use the advantages of forest systems but with the focus of providing food. When we grow food conventionally, even organically, we focus primarily on annual crops which must be replanted every year. Because of this level of soil disturbance, nutrients and biodiversity are constantly leaving the system. The effect is even larger if we add harsh chemicals to the soil. Trees, shrub, and perennial species allow the soil grow over time as the biology of the soil increases in volume and complexity. Unlike orchards, in forest gardens we sacrifice huge yields of a single crop, such as apples, for diversity. This may increase the work for harvesting and is not as effective to sell as a crop. Instead, the picking is spread out over more time and never boring or repetitive. Most importantly this provides a much more balanced diet for the community. The garden becomes a healthier ecosystem as well and is much less likely to suffer from pests. A bad year for any one species will not particularly effect the overall produce of the garden. As every plant requires slightly different things from the soil, the garden balances the needs of a larger number of plants. Many of these plants will fertilize the soil, attract pollinators and beneficial insects, repel pests or serve several other functions that would normally require our work. One key to forest gardens is that they are built in layers, like a forest. We introduce species from the largest trees down to the smallest ground plants, vines and mushrooms so that every available space has something we want. If you don’t have something you want growing in a layer, you will likely find yourself fighting a weed that takes the space. By filling in all the layers, we give ourselves much less work in the long run. Though we can spend a lot of time picking all the food!